Are paranoia and a marked taste for intrigue especially great in Spanish speaking cultures? Are these French and Italian characteristics as well? Mediterranean generally? Why is the Portuguese faculty the most reality based? I realize I am suggesting very broad generalizations but I have reason to ask these questions. I will be grateful for all answers but I would particularly like an answer from a Romance Philologist. If this answer indeed confirms a general cultural attitude, it will ideally, although not necessarily cite instances or evidence of this attitude in Medieval and Renaissance texts. Hurricane Katrina, five years on and still so many people are not home. So they can come home and stay, we need a coast, and for that we need among other things a United States Senator who supports coastal restoration. Charlie Melançon won the Democratic primary last night and we truly deserve your contributions to his underdog campaign against David Vitter, R-BP, for the seat in the U.S. Senate Vitter now holds. I do not agree with all of Melançon’s views but it is precisely his conservatism which makes him a viable candidate in this area, and he will stand for reason where Vitter does not. Again, please consider supporting Melançon and, thereby, all of Louisiana as well as the entire United States, since what happens here DOES have an impact on what happens to the rest of you. The other suggestion they are making on the radio is to support a musician to return to New Orleans. Many of those who cannot afford to return due to the housing situation are musicians whose presence here would help ensure the continued existence of the important engine of world musical culture we are. You can buy a good CD at a low price and otherwise support the New Orleans Musicians’ Relief Fund right here. 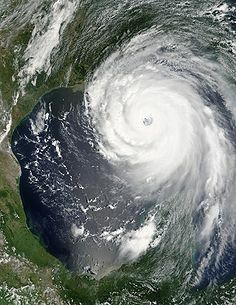 Here is a Category 5 hurricane nearing the Louisiana coast exactly five years ago today. A few hours after this picture was taken, Katrina came on in. The storm was on a Monday. Saturday and Sunday were comparatively festive, the traffic moving slowly to and through Maringouin in contraflow. Monday classes had already been canceled. There was a pre-storm dance Sunday afternoon, with fiddlers. We never feel these storms as much in Maringouin but the heavy atmosphere of the outer bands was here, and we were tense and worried about what might happen en ville. Then the storm had come through and it hadn’t been as bad as one feared, and we drank wine. Then the levees broke. I remember that for about six hours there were people unable to grasp the news. I had grasped it instantly and knew its meaning, which was the basis for my own state of shock. It is the weekend, so we must sing! This is Lila Downs. I had a piece of marinated and grilled steak, grilled asparagus, green salad, papaya, and white wine. I should have had red wine, but I did not have any, and now I want chocolate mousse, but I do not have any. I am eating a bad Camembert. Some of my favorite desserts, however, are miso soup with seaweed and tofu, steamed spring rolls, and sushi. Last night I had chicken legs stuffed with onions and green peppers, and green salad with tomatoes. I had two entire chicken legs. I had not planned on that, but when I bit into the first one, I realized how hungry I was and knew that the second one was a goner. I was too full after that. I would have done better to boil some egg noodles to go with that first chicken leg. Which leads me to my question: do you who eat meat, plan balanced meals? I do not, but I am planning to begin. When I was a very small child, our dinner was: meat, fish, or fowl; shell macaroni or lima beans; a green vegetable; green salad. Then we moved up to meat and green salad only. This was for a number of reasons but I believe we were in part celebrating not being in the Depression or in World War II, eras in which one could not have gotten hold of so much meat. I still tend to cook this way since it is Very Easy — you make the salad while the meat grills, and there you are. However, I note that I feel much better if I cut down on the meat — way down — and eat one or two green vegetables and let us say, some brown rice. And fizzy water, green tea and miso soup do me far more good than do milk, juice, beer, or wine. I feel heretical saying this — that I would reduce meat quantities and eat brown rice. I appear to have learned that not to be grateful for all the meat and dairy products is not to empathize with those who missed these items in the Depression, and had them rationed in the War. Still I ask: am I the only one who, on just meat and salad, is either too full or too hungry? Our building is only air conditioned part of the day, which means the air conditioning is only really effective in the afternoons, soon before it is turned off again. All the offices, and all the classrooms are the same size. Blackguard: I have a very large class, 32 students! I am so popular and heroic that I have accepted two students over the limit! But the room only has 30 chairs! Z: I am sure more chairs can be brought. Blackguard: No! The secretary will get me a larger, more modern room, with air conditioning! I wish I had that kind of faith. Filed under Da Whiteman, News, What Is A Scholar? (Despite reports that the amount of oil the gulf is decreasing, the number of oiled birds found daily has increased since BP capped the well, according to the Times-Picayune).